I can usually tell whether I like a pair of shoes right out of the box on the first run - with the Saucony Mirage, my initial impressions have held up to be true after 500+ miles in my first pair. This is an excellent everyday training shoe! I rotate through several pairs of shoes on a day to day basis. While the Kinvaras are great for easier recovery runs, I usually want something with a tiny bit more "substance" on long runs, fartleks, etc. Last year I did a lot of running in the Saucony Tangents. When that model was discontinued, I needed something to fill the void. When I first wore the Mirages, it became obvious to me why Saucony didn't need the Tangent in their lineup anymore, because the Mirage is a perfect (and much improved, in my opinion) replacement for the Tangent. Saucony places the Mirage in their minimalism category. I agree with that - it is a very light and responsive shoe without any extra / unnecessary frills. 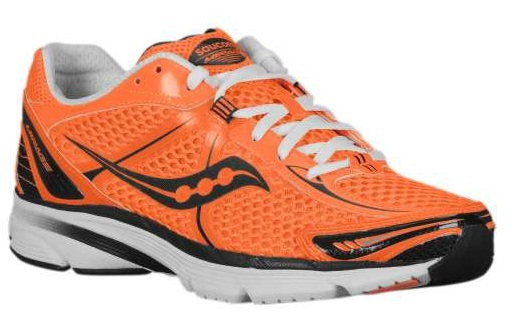 There is a very subtle medial stability post, and it is a bit more cushioned than the Kinvara. As a neutral runner, I love the fit and feel while wearing the Mirage. In fact, it has become my favorite day-to-day trainer... and occasionally (when I'm not wearing my Fastwitches) it has served me well on tempo runs. I think the Mirage is a great choice for someone looking to step down to a lighter shoe that encourages good running form, but still wants some lightweight stability and cushioning. The heel to toe drop is 4mm (like the Kinvara), although it has a more substantial, "grippier", (and probably more durable) outsole. The heel counter also offers a bit more stability than something like the Kinvara. I have multiple pairs still in their boxes in my closet, if that tells you anything about how much I like this shoe. And like the Kinvara, Saucony is making the Mirage is a plethora of cool color schemes. Check 'em out.